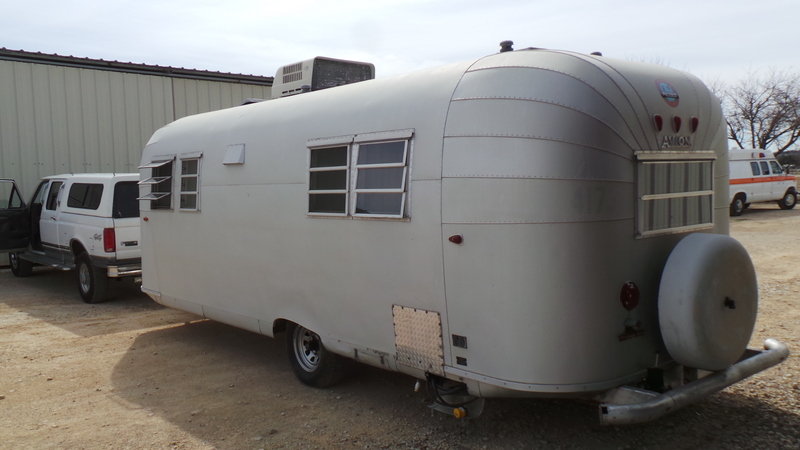 Here is one fine built vintage travel trailer. This is a rare 1966 single axle AVION. These trailers seem to be better built than the Airstreams. The trailer is a perfect size, 25 feet. Not too big, not too small. It can be pulled with just about anything. The outer aluminum skin is almost perfect. No hail damage at all! It has fairly new custom made twin beds, later model hot water heater and very cold running air conditioning. It also has a newer refrigerator. The original front couch was removed when I bought it. So…I bought a period correct sleeper couch. But need help getting it inside. The trailer is currently useable but needs some cleaning. It hasn’t been camped in over a year. Its just been sitting in storage. Comes with a clear Texas title. The trailer is located in San Antonio Texas. Call Hawkeye for more details. 210-548-1310.